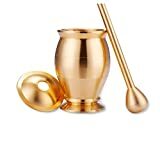 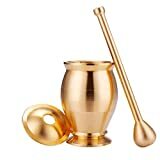 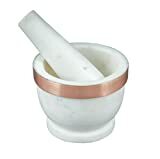 This classy and cool new Copper Mortar & Pestle will add a sophisticated flair to your kitchen countertop collection. 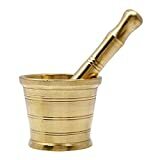 Handcrafted by coppersmiths, each mortar is made from polished copper that will develop a rich patina over time. 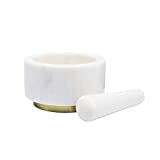 The receptacle is lined with food-safe, easy-to-clean tin that will preserve your food's flavor and fragrances as you grind them to smithereens. 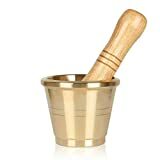 Standing 4 inches tall, you can be sure that the mortar's high sides will keep your crushed items from flying frustratingly about. 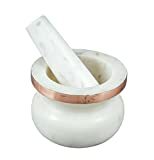 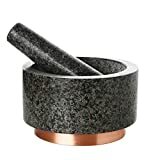 Thirstystone NM292 Patina Vie Marble Mortar and Pestle 4"